Who Couldn't Love A City Like This? Who can't love noodling about on one's bike through a city as gorgeous as this? That little girl's brother was oogling my bike and I said "do you have a bike?" "They're a lot of fun aren't they?" Sister scoots up and chimes "I have a bike too!" I replied, "I LOVE my bike!" and rode off beaming with a smile. ps...DOH! Suppose it might help to share the name! Binghamton, upstate New York...about halfway between Scranton, PA to the south and Syracuse, NY to the north. This is beautiful. I would walk there every day in good weather! great story - and .....and makes me look back with such fondness on my days in upstate -- Syracuse, to be exact. Sounds like a wonderful place to live, Don! How lucky for you that you live there. Yes indeed! A gorgeous city to enjoy your favorite activity and to share it with fellow enthusiasts! Wow! The scene looks like a post card. Sounds like couple of nice kids. Upstate NY is so pretty. (I see Finger Lakes Region mentioned). As a kid my family camped at Buttermilk Falls, Robert Treman State Park, Gilbert Lake, Letchworth, and Harriman State Park, and I spent a year at SUNY Fredonia. I feel inspired to haul out my mother's racks of slides and digitize them, thanks for such a pleasant blog! I love this blog... reminds us to keep the joy and the fun in our active lives... I remember one time telling a little girl at one of the obstacle courses I did that yes, grandma-aged ladies could play in the mud! Play is good! Go play! Aww, nice encounter with children. Their enthusiasm is great. Beautiful place. Hard to believe it's in the city. Lovely! 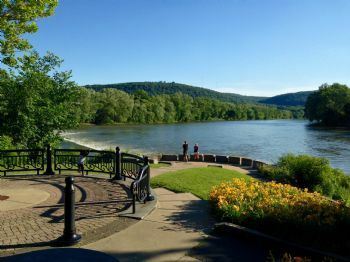 One area where Binghamton and Broome County as a whole can compete with the best is the number and variety of public parks. You've got free parking, lake swimming, pool swimming, single-track, paved, and cindered bike trails, hiking trails, and of course free public carousels. What a wonderful experience. I'm glad you shared loving your bike with them. Kids need to know it's OK to keep loving their bikes when they grow up. How awesome to share the love of biking w/kids! Had to be a great moment! Thanks for sharing the beautiful picture, too. Absolutely would be calling my name too. Lovely city. Fun to share the love of biking with the little ones. Such nice energy in your blogs. Have a happy day.